Fancy a Gurkha? Or a George? I had a day-out yesterday, not a shopping/special event/friends kind of day out, more of a welly-booted farmer's day out: we latched the trailer onto the old Peugeot and set off for Godstone, heading clockwise on the M25. When I say old, I mean old: 120,000 miles on the clock, one of the doors has a nail jammed into the hinge so it doesn't fall off, and the front seats are bucket style through decades of slumped arses, rather than by design. The doors don't lock either but that's hardly a concern. We were picking up a second-hand 1,000 litre water tank for the farm and stopped in Godstone for lunch at what we thought was a pub but turned out to be a Nepalese and Indian restaurant, Lal Akash, that had held onto one of the former pub bars, complete with stool-perching beer-drinking locals. In the bar you could have pizza and chicken nuggets and chips; in the restaurant there were a range of Nepalese specialities and the usual Indian restaurant fare. And that's where I ordered Gurkha Rifle with chapati. When I read it on the menu I immediately thought of Clive Dunn as Jonesy in Dad's Army. 'They don't like it up 'em, Capt. Mainwaring!' The reality is boneless chicken cooked with chilli, ginger and garlic in a hot spicy sauce. 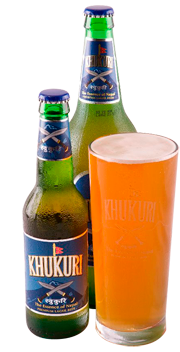 I also tried a Khukuri: no, I didn't have a go at wielding a curved Nepalese knife, it's a Nepalese beer brewed in the UK that packs a punch at lunchtime. Notice the paucity of photographs? I left my camera at home... But I did learn how to say 'thank you' in Nepali: 'dhanybad'. And I said it several times: the food was freshly cooked and the service full of smiles. And even though we only ordered for two there seemed to be enough for a small regiment of Gurkhas. One of those lunches where you can't imagine eating for at least another 24 hours. Today, 1st March, is St. David's Day - the patron saint of Wales. I made welshcakes as I do every year. Packed two little boxes of them to take to my step-daughters tomorrow. I've never heard any of my English friends talk about any particular recipe in association with St. George's Day (April 23rd). The BBC Good Food website has a list of St George's Day recipes but I feel suspicious about its authenticity when the first recipe is Full English Frittata! But how do you choose between what's English and what's generally British? 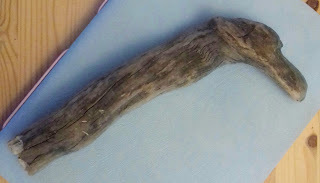 Cornish Pastie, maybe. But that's specifically Cornish. Same with Lancashire Hotpot and Clotted Cream: they're regional. What would an English person choose to cook on St. George's Day that's quintessentially English? Write about a food that encapsulates your personality.